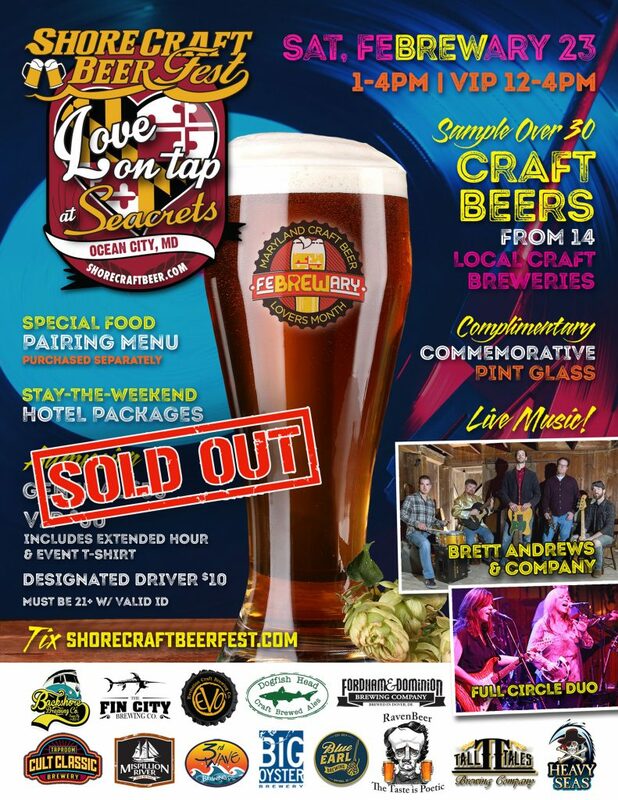 Shore Craft Beer and Seacrets bring you the 4th Annual Shore Craft Beer Fest: Love On Tap! Enjoy live music, 25+ craft beers, a commemorative event cup and a chance to talk to the local brewers about their beer! Each brewery is making beer especially for FeBREWary and Craft Beer Lovers Month and will bring at least two of their beers for you to sample. Live entertainment from Brett Andrews & Company and the Full Circle Duo. Includes Unlimited Tastings, Complimentary Commemorative Cup, Discussion with Local Craft Beer Experts and Live Entertainment. Includes additional hour at event (12pm admission), Event T-shirt, Unlimited Tastings, Complimentary Commemorative Cup, Discussion with Local Craft Beer Experts and Live Entertainment. Special Hotel Packages also available! Package includes your accommodation and tickets to the Festival. * Must be 21+ with valid ID to attend.